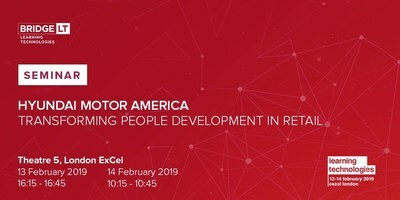 Vlad Shishkaryov, CEO of Bridge Learning Technologies, has announced that Jared Dowdy, Senior Manager in National Sales Training for Hyundai Motor America will be presenting a seminar at the Learning Technologies exhibition, held in the London ExCeL Centre next week. "We are delighted that Jared is joining us at the Learning Technologies exhibition. We have worked closely together and it is always enlightening to hear the client's perspective." The seminar, "Transforming People Development in Retail", will focus in particular on the collaboration between HMA and Bridge LT in developing and implementing the 'Test Drive Suite', an innovative dealer training tool supporting the 2019 launch of the All-New Santa Fe. After the success of this implementation, the Test Drive Suite will now be used for more upcoming product launches in 2019. Speaking about the upcoming seminar, Jared said, "It is a privilege to be sharing my experiences with Bridge LT and connecting with the leaders in the field at this prestigious exhibition which showcases the very best of learning technology." Jared will also be making an appearance at Bridge LT's stand during the two days of the exhibition. There are two opportunities to catch Jared's seminar and ask him questions: on 13 February at 16.15 and on 14 February at 10.15, both in Theatre 5. Visitors to the exhibition can also find out more about the Test Drive Suite and other learning tools that have been developed by visiting Bridge LT at Stand G55. Jared Dowdy has many years' experience in the automotive industry and now concentrates on new product training using the latest technology. "Jared is a powerhouse in the L&D field. He drives performance and business improvement through innovation which is a perfect fit for Bridge LT's objectives when working with a client," Vlad explained.